Martial arts equipment, Training gear, Karate suits, martial art weapons, sparring gear, it's all here. Custom Made for your club - Really stand out at competitions, seminars etc. 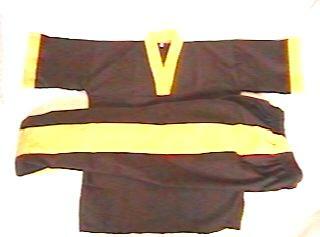 and ideal for Karate, Tae Kwon Do, Kickboxing etc. These suits are custom made to your design. Please e-mail using the link below for pricing enquiries (Min order 5 suits) These suits are made to the highest standard in the UK. To order please fill in the enquiry form below. Martial Arts Supplies and martial arts equipment from every martial arts supplies manufacturer at discount prices, Guaranteed lowest prices on martial arts equipment from Century, Nike, TEKNO, Macho, RheeMax, Adidas and all other martial arts supplies manufacturers! @llBlackBelt Martial Arts Supplies carries a huge selection of martial arts equipment at discount prices, All of our training equipment, martial arts supplies and karate gear features our low price guarantee, and we will match any competitor's price. For all you martial artists over here in the UK, here are some recommendations for good martial arts equipment suppliers who are local. For your supplies of the best quality and CHEAPEST training mats in the UK. I recently bought some training mats for a new class I am opening shortly and after scouring the web for the best deal, I found this company.